Follow I-84 West to Exit 15 and turn right onto Route 67. You must make a left at about 1-1/2 miles to continue on Route 67 for about 17 miles. This will bring you into New Milford. At the intersection of Routes 67 and 202, bear left for approximately 2/10 of a mile to the Village Green. Turn right at the Green and proceed north to the end. Turn left at the stop sign and make an immediate right onto Aspetuck Avenue. Proceed to the crest of the hill. Follow the signs to the parking lots.Â Fields located past fieldhouse and above football field. Follow the Garden State Parkway or I-287 north to the Governor Malcolm Wilson Tappan Zee Bridge. One mile to I-287 East to I-684 North. Proceed until Exit 9E to I-84 East. Take Exit 7 (left exit) an expressway which merges into Route 7 North\Route 202 East to New Milford. Proceed approximately 5 miles. Bear right at the intersection and follow Route 67 East\Route 202 East across the bridge. Go through three traffic lights. Immediately after the third light, turn left onto Main Street. Proceed to the end of the Village Green. Turn left at the stop sign and make an immediate right onto Aspetuck Avenue. Proceed to the crest of the hill. Follow the signs to the Admissions Office located in Steele Hall. Follow I-84 West to Exit 15 and turn right onto Route 67. You must make a left at about 1-1/2 miles to continue on Route 67 for about 17 miles. This will bring you into New Milford. At the intersection of Routes 67 and 202, bear left for approximately 2/10 of a mile to the Village Green. Turn right at the Green and proceed north to the end. Turn left at the stop sign and make an immediate right onto Aspetuck Avenue. Proceed to the crest of the hill. Follow the signs to the Admissions Office located in Steele Hall. Directions: Directions to Danbury Youth Lacrosse Fieldsâ€¦â€¦. Route 7, or 684, to 84 Eastâ€¦ Take Exit 5, at Stop sign at the end of ramp go straight, at light end bottom of hill go straight on to North Streetâ€¦ stay straight on North Street, you will pass under 84â€¦at second light after going under 84 turn rightâ€¦at next light turn right, you will go back under 84 and have Cemetery on your leftâ€¦at next light turn left*(Danbury Hospital on your right)â€¦fields at Broadview Middle School are Â¼ mile on your right. 84 West to Exit 6â€¦at light at end of ramp turn rightâ€¦..at next light turn rightâ€¦.at next light turn rightâ€¦go under 84(cemetery on your left) and at next light turn left*(Danbury Hospital on your right)â€¦fields at Broadview Middle School are Â¼ mile on your right. Directions: From South: Route 8 N. to Route 84 W. to exit 17. Make Left at Light (Rt. 63). 1/2 Mile on Left is entrance to Hop Brook State Park. Enter park. Field is 1/8 mile down on left. From West: Route 84 E. to exit 17. Make Right at light (Rt. 63). 1/2 Mile on Left is entrance to Hop Brook State Park. Field is 1/8 mile down on left. From East: Route 84 West.Follow above directions. Take exit 5. Stay in the right lane. Continue straight through the stop sign. At the traffic light stay in the right lane and proceed straight onto Rt 37. Take 37 North for apx 5.5 mi to the traffic light in the New Fairfield town center. Make a left onto Brush Hill Rd and go to the top of the hill (0.4mi). Bear left and make a quick right onto Gilotti Rd (Consolidated School will be on your right)Proceed 0.3mi and New Fairfield High School will be on your right. Drive through the High School parking lot, all the way past the building, and the field is at the far west end of the property. Proceed from the end of 684 onto Rt 22 (just stay straight) to the frst traffic light. Make a right onto Milltown Rd. Go apx 4.4mi to the the end which will be Rt 39 (Ballpond Rd). Make a left and proceed to traffic light (0.6mi). Make a right onto Gilotti Rd. Proceed on Gilotti Rd for 1.6mi and New Fairfield High School will be on your left. Drive through the High School parking lot, all the way past the building, and the field is at the far west end of the property. 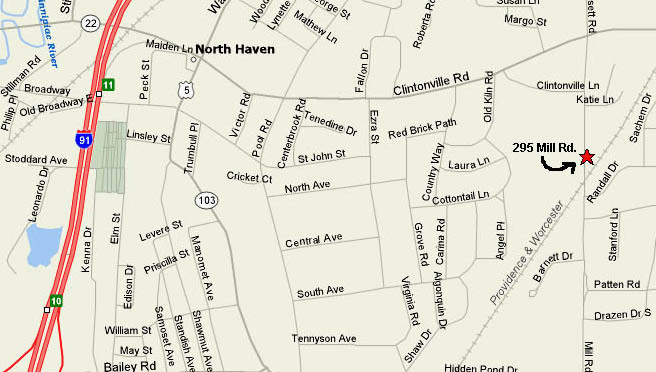 2) Take the CT-22E exit (EXIT 11) toward rte 5N NORTH HAVEN. 3) Turn RIGHT onto ROUTE 22. Continue across Washington Ave as Rte 22 turns into Clintonville Road. 4) Continue about 2 miles. 5) Turn right at light onto Mill Road (if you went left here, youâ€™d head to Gateway CC). 1) Take 91 North towards Hartford to Exit 11 - take a right off the exit onto Rte 22. 2) Take a right at 1st light = Washington Avenue for just a block. 3) Take a right at 1st light onto Broadway for 1 more block. 4) At the next light take a left onto Elm St.
5) Take a left into the North Haven Community Pool Parking Lot. 1) Take 91 South to exit for Washington Ave No Haven. Take a left at the light off the exit onto Washington Avenue. 2) At the seventh light take a right on to Broadway for just 1 block. 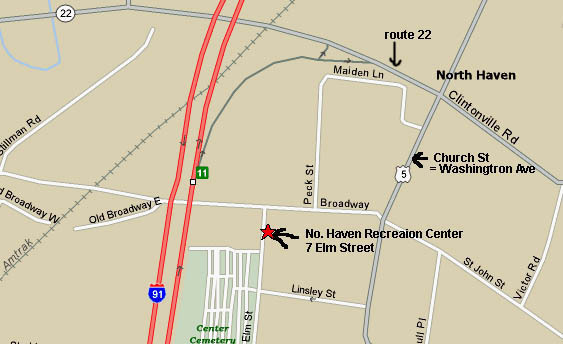 3) At the next light take a left onto Elm St.
4) Take a left into the North Haven Community Pool Parking Lot. Directions: Traveling south I-95 take Exit 70: Right at bottom of exit onto Route 1. Follow Route 1 approximately 2 Â½ miles. Illianoâ€™s and Laysville General Store (good food)will be on the right. Take the next left onto Town Woods road. Follow to stop sign and continue straight. Take your next left into the Lymes Senior Center/Town Woods Fields. The field parking is located directly in front of you. Traveling north on I 95 take Exit 70: Left at the bottom of the exit onto Route 1. 2nd traffic light turn right following Route 1. Continue on Route 1 to the end (2nd traffic light) and turn left following Route 1. Follow Route 1 approximately 2 Â½ miles. Illianoâ€™s and Laysville general Store (good food) will be on the right. Take the next left onto Town Woods road. Follow to stop sign and continue straight for approximately .1 mile. Take your next left into the Lymes Senior Center/Town Woods Fields. The field parking is located directly in front of you. Directions: From I-95 Southbound take Exit 70: Right at bottom of exit onto Route 1. Follow Route 1 approximately 2 Â½ miles. Illianoâ€™s and Laysville will be on the right. Take the next left onto Townwoods road. Follow to stop sign and continue straight. Take your next left into the Lymes Senior Center/Townwoods Fields. The field parking is located directly in front of you. From I-95 Northbound take Exit 70: Left at the bottom of the exit onto Route 1. 2nd traffic light turn right following Route 1. Continue on Route 1 to the end (2nd traffic light) and turn left following Route 1. Follow Route 1 approximately 2 Â½ miles. Illianoâ€™s and Laysville will be on the right. Take the next left onto Townwoods road. Follow to stop sign and continue straight for approximately .1 mile. Take your next left into the Lymes Senior Center/Townwoods Fields. The field parking is located directly in front of you. From South - Rt 8 No. to xt. 37 (Rt. 262). Make left at exit. At 2nd lite make left. Entrance to J Trumbull PS is first driveway on right.